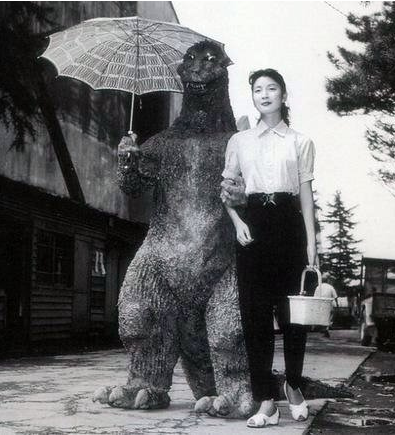 Godzilla goes on date?. 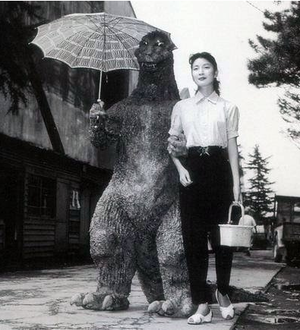 unsure, but think this may be a behind the scenes 사진 from the original Godzilla. Wallpaper and background images in the Godzilla club tagged: photo godzilla toho studios japanese sci fi horror movies godzilla costume umbrella. This Godzilla photo might contain 파라솔 and 양산. ...Eat your heart out, Creature from the Black Lagoon! lol!